I write this with yet another piece of baby spit spin art on my sweater. So prolific is the baby sprinkler that any shirt or sweater gets a TSA-level pat down to check for stains. Despite this, we regularly walk out of the house not realizing that we’re wearing a piece from the TRBL Fall collection – usually highlighted by some over the shoulder milk stain in the shape of Michigan. Timothy continues to eat well and is getting bigger and bigger. He has remained healthy, even though his breathing sometimes sounds a little raspy. His right eye was getting ‘gunked up’(apologies for the medical term) but is doing much better. He is really thriving and is getting stronger and is holding his head up very well. When he smiles, it just lights you up. Timothy’s first Thanksgiving coincides with his maiden car trip and first visit to see the Brandons in Indianapolis. The twelve hours on the road with a three month old was not bad, though the mood inside the car varied from library (‘shhh, the baby’s asleep’) to emergency room (‘oh no, he’s awake – get me a pacifier and a burp cloth, now!’). When I took improv comedy classes, I learned a concept called ‘Yes and…’, which means that when your partner on stage throws out an idea, you must take that idea as a gift and roll with it. Don’t waste your time fighting or denying– just accept it and go with it. I’ve often found that concept useful, but never more so than with the events of the past year. A year ago we were moving along with 2 teenage girls and a dog and looking toward high school and college, and now we’re a dog down, a baby up and the snow globe has been shaken up. 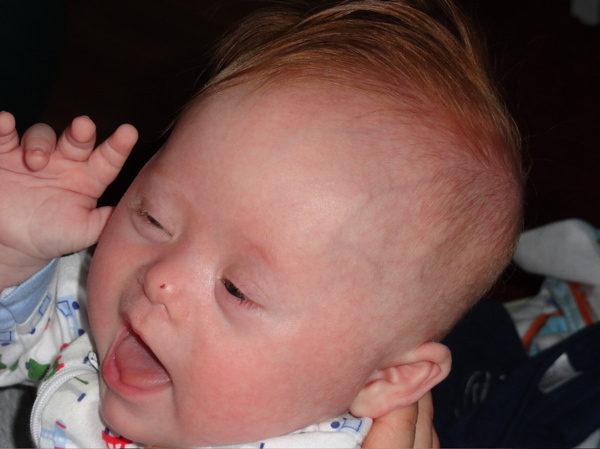 I know, from talking with so many families with kids with Down syndrome, that Timothy having Down syndrome will be a real blessing. But right now we’re just enjoying this incredible baby, are anxious about Downs but trying not to worry about what that’ll mean for him in the future. That’s where a little bit of ‘yes…and’ and a lot of faith will help us roll with where this adventure takes us. We know that it’ll work out just fine – it may just feel different and be less tidy than we’d like. So no better time for us than Thanksgiving, with Laura’s family (who put the ‘B’ in TRBL), to wipe the baby spit from our clothes for a moment and reflect. To remember that our situation right now is really more inconvenient than truly tough, especially in light of people we know who are enduring much more difficult things. And to be so thankful that in the midst of our hiccup, we’re surrounded by such a huge amount of support from the incredible people in our lives who have helped and prayed and supported us ever since the arrival of this little red haired speed bump.